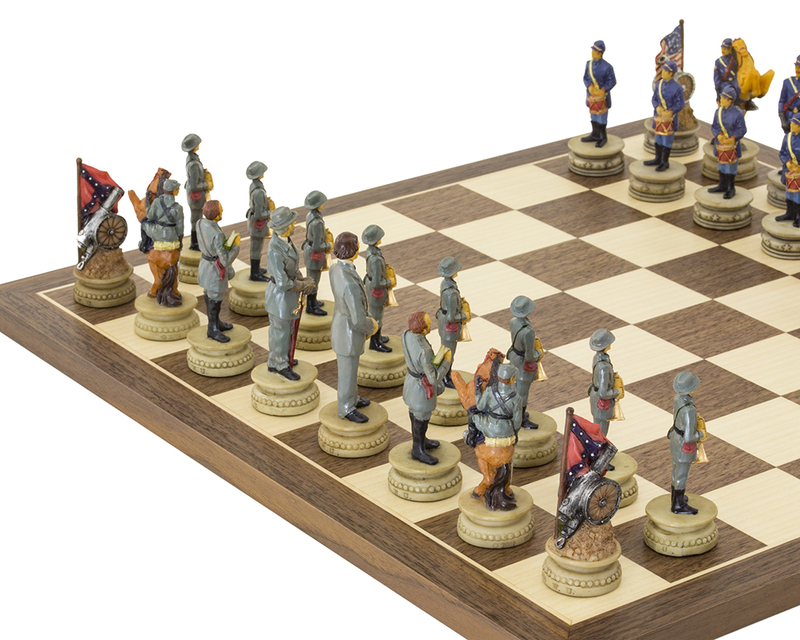 Civil War chess set pieces combined with a stunning walnut chess board, The pieces are from Italy, the board Spain. 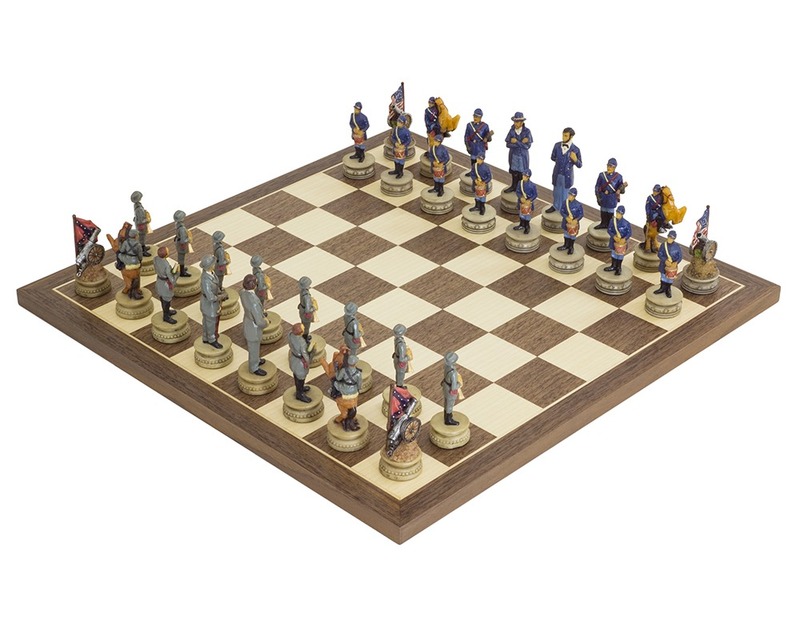 Superb quality chess set from reputable European Manufacturers. Matched with a beautiful 15.75 inch Walnut and Maple board. World famous Italfama of Italy have been meticulous in their detailing of these pieces, with the smartly adored footmen bearing drums or trumpets, up through the higher ranking players atop horses or bearing a steadfast demeanour. The noteworthy rooks, each portrayed as a cannon but with their own respective flag flying regally above, each motivating their own camp on. With his easily recognisable stance, the Union king needs no introduction. 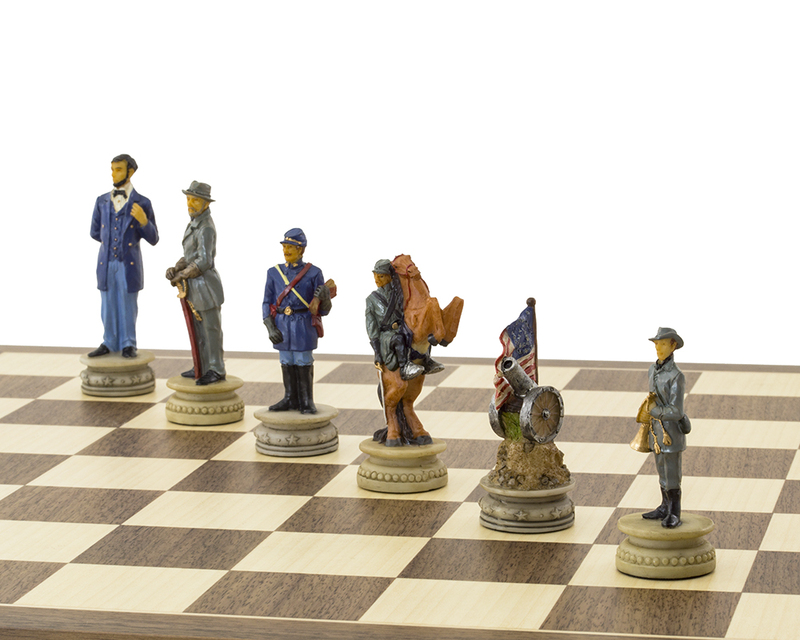 Abraham Lincoln was the victor in one the of the bloodiest battles in history. 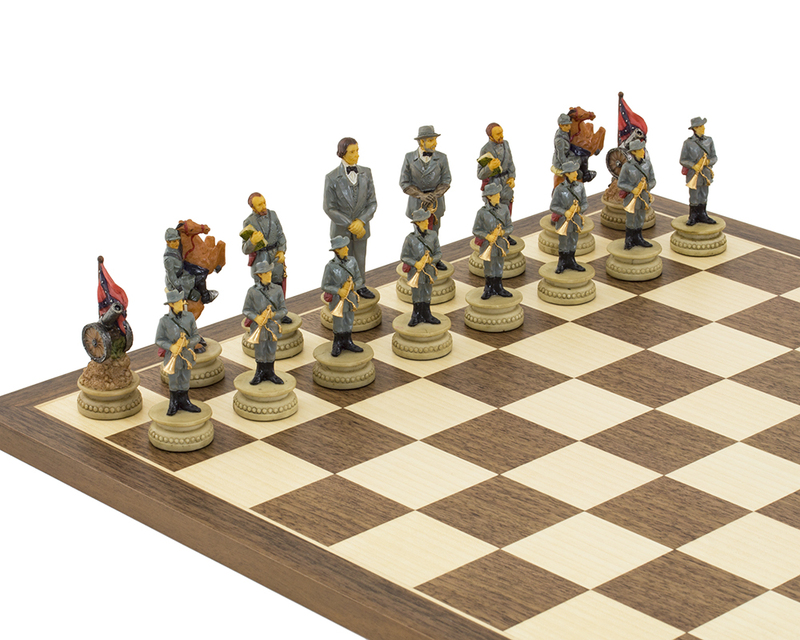 Despite his defeat, Jefferson Davis stands tall, proud and imposing, ready to once again lead his beloved Confederacy back into battle and what better battlefield than this stunning 15.75 inch walnut and maple chess board made by Rechapados Ferrer of Spain. 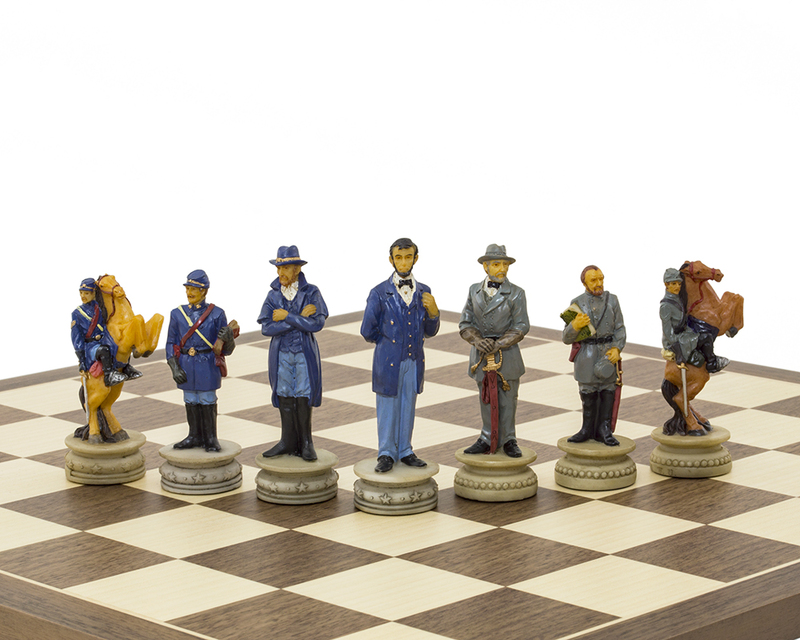 The American Civil War Chessmen can be purchased separately, but with or without the board, this is a superb gift for any US history lover or chess enthusiast. Although the Revolution of 1776-1783 created the United States, it was the Civil War of 1861-1865 that determined what sort of nation it would be. It settled two major issues that were unresolved by the revolution - to determine whether the United States was to be a "dissolvable confederation of sovereign states" or to be "an indivisible nation with a sovereign national government” and whether "this nation who declared that all men were created with equal rights to liberty" would continue to exist as the dominant slaveholding country in the world. The 'touch paper’, for this war, was ignited at Fort Sumter. Claiming this fort as their own, the Confederate army opened fire on the Charleston Bay garrison on April 12, 1861 and forced surrender and the lowering of the American flag. The real hostilities began in 1862 and the huge campaigns in Tennessee, Virginia, and Maryland hinted at the even bigger battles at Gettysburg, Vicksburg,Chickamauga and Atlanta. Robert E. Lee's Army of Northern Virginia endured 3 long years from 1862-1865, thwarting attacks by the Union Army of the Potomac. Finally, Grant called time on Lee at Appomattox in April 1865 and all the main Confederate armies surrendered. 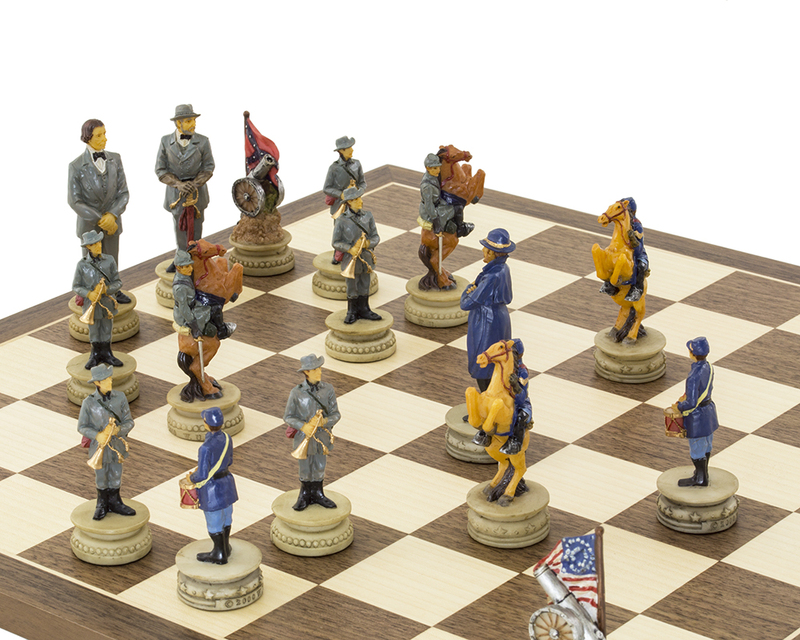 It was only when the Union cavalry apprehended the Confederate President, Jefferson Davis, in Georgia on May 10, 1865, that all resistance ceased and the war ended. The onerous task of rebuilding the united nation, free of slavery, began.